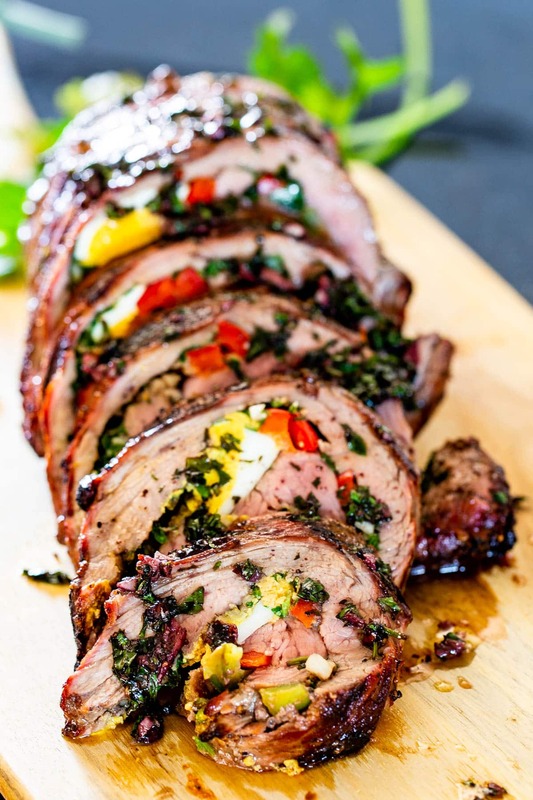 This Matambre is an Argentinian Stuffed Flank Steak with hard boiled eggs, bell peppers, a mixture of cilantro, garlic and olive oil. The matambre is then grilled to perfection and cut into thin slices before enjoying. 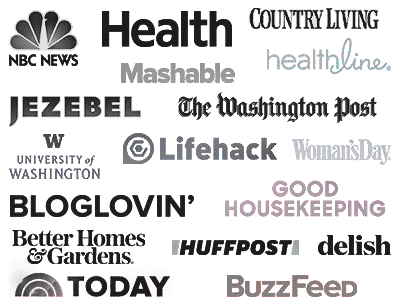 Over the years, I’ve loved sharing with you recipes from all over the world. 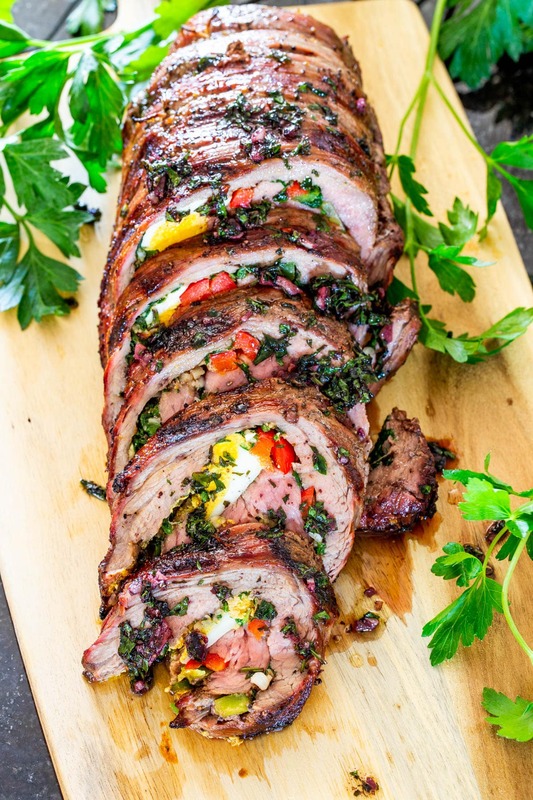 This Argentinian stuffed flank steak, called matambre, is one of the most popular recipes I’ve shared with you. It such a simple dish, yet elegant, impressive and very little effort required. Matambre, also known as saudero in some Latin American countries, is the name of a dish consisting of a thin cut of beef, like flank steak. When translated literally from Spanish, the word “matambre” is a combination of two words: matar and hambre. Matar means “to kill”, and hambre means “hunger”. Therefore, “matambre” translated literally means hunger killer. It is also referred to as Matambre Arrolado or Matambre Relleno. It is normally stuffed or filled and it comes from Argentina or Uruguay. The ingredients for the stuffing can vary from province to province, but mostly commonly include whole carrots, hard boiled, eggs and lots of black pepper. The thin cut of beef is a cut from the side of the cow, between the skin and the ribs, usually known as “fly shaker” or “elephant ear”. Because this is usually hard to find in stores here, flank steak is a great and affordable substitute. Flank steak comes from the cow’s lower chest or abdominal muscle. I love using it, because it’s usually inexpensive, but a super flavorful and versatile cut of beef. It’s usually sold about a foot long and one inch in thickness. This cut is also known as jiffy steak or London broil. A flank steak is so versatile and once you butterfly it, it opens up to all kinds of possibilities when it comes to different fillings. Lay the flank steak flat on a cutting board. Use a sharp knife to cut into the steak from top to bottom to bottom, keeping the knife level with the cutting board. Keep your other hand flat on top of the knife to hold it secure. Fold the top half back and continue cutting the top half away from the bottom half, working slowly. Continue cutting until the steak opens up flat. Do not cut all the way through the steak. If your cut isn’t even, don’t worry. You could always pound it with a meat mallet to make it more even. In the end it really doesn’t matter, because you’ll be filling it then rolling it back up. What Ingredients Do You Need To Make Matambre? 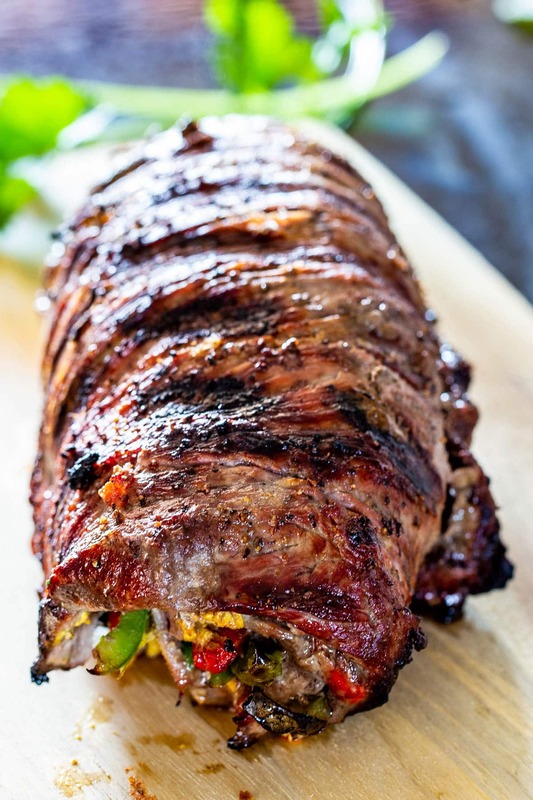 Flank steak – you’ll need about a 2 pound piece of flank steak. I usually buy mine at Costco, they come 2 in a package, use one and freeze the other for later. Super economical. Olive oil – You’ll need some olive oil for the quasi chimichurri sauce. Garlic – lots of garlic as usual. Herbs – such as fresh cilantro and parsley. Salt & pepper – use as much or as little as you like. Red pepper flakes – to kick things up a notch, use more or less as you like. Hard boiled eggs – cut into quarters. Bell peppers – I used half a green and half a red bell pepper for color. You could also add some thin strips of carrots if you like. I grilled my matambre but you can also roast it in the oven. I have provided instructions for both. Butterfly the flank steak: Using a sharp knife slice it and open it up like a book (see instructions above for how to butterfly a flank steak). If you want to make the meat thinner, you can pound it with a mallet to flatten it out and even out the thickness. Make the quasi chimichurri sauce: I made up my my own concoction with some olive oil, tons of garlic, cilantro, parsley, black pepper, salt and a bit of red pepper flakes. It’s sort of like a chimichurri sauce, but not really. Assemble matambre: Spread the cilantro and parsley mixture over the flank steak, and brush it evenly over the entire surface of the steak. Arrange the quartered eggs in 3 rows across the flank steak at different intervals. Repeat with the sliced peppers. Carefully roll the meat up over the filling, I did it from left to right, across the grain, jelly roll style. Tie with butcher’s twine to hold it together. Season the outside of the roll generously with salt and pepper. Prepare your grill for cooking over medium direct heat. The temperature on your grill should read around 400 F degrees. 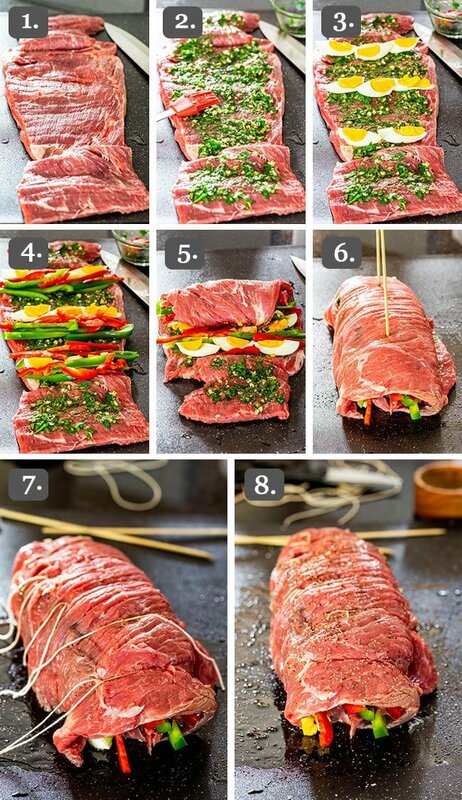 Place the roll on the grill and grill on both sides for about 4 or 5 minutes per side, about 20 minutes in total. Let the roll rest for 15 minutes before slicing into it. If the inside of the matambre is not done to your liking and prefer the meat more well done, place the roll in a baking dish and roast in the oven for another 20 minutes at 400 F degrees. You can also put it back on the grill, cover it with aluminum foil so it doesn’t burn and continue grilling it for a few more minutes until done to your liking. Place the roll seam-side down on an aluminum foil lined baking sheet. Bake the matambre for 1 hour. Remove from the oven and let it rest for 10 minutes before slicing into it. Transfer leftover matambre to an airtight container and refrigerate for up to 3 days. I wouldn’t keep it longer because of the hard boiled eggs. Hi! I made this for my family tonight. The flavors were amazing! This recipe was fun to make. I drizzled a small amount of good quality balsamic vinegar over the top. The only complaint from my family was I didn’t make enough for seconds. Prepare grill: Prepare your grill for cooking over medium direct heat. 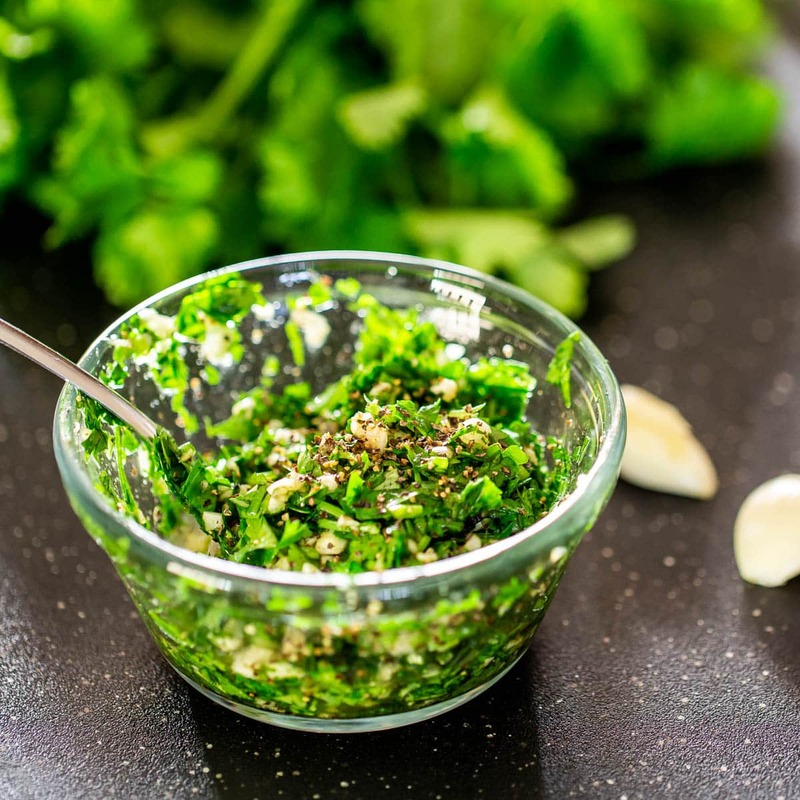 Make chimichurri: In a small bowl mix together the olive oil, cilantro, parsley, garlic, salt, black pepper and red pepper flakes. Spread sauce over steak: Spread the cilantro and parsley mixture over the flank steak, and brush it evenly over the entire surface of the steak. Assemble matambre: Arrange the quartered eggs in 3 rows across the flank steak at different intervals. Repeat with the sliced peppers. Carefully roll the meat up over the filling, I did it from left to right, across the grain, jelly roll style. Tie with butcher's twine to hold it together. Season the outside of the roll generously with salt and pepper. Grill: The temperature on your grill should read around 400 F degrees. Place the roll on the grill and grill on both sides for about 4 or 5 minutes per side, about 20 minutes in total. Rest: Let the roll rest for 15 minutes before slicing into it. Oven instructions: Preheat your oven to 350 F degrees. Place the roll seam-side down on an aluminum foil lined baking sheet. Bake the matambre for 1 hour. Remove from the oven and let it rest for 10 minutes before slicing into it. Leftovers: Transfer leftover matambre to an airtight container and refrigerate for up to 3 days. I wouldn’t keep it longer because of the hard boiled eggs. Recipe originally shared September 2015. Could you recommend another herb than cilantro? Thank you! Btw your recipes are amazing! Beter than butterfly: beat entire flank till about double in size. Smear/spread pesto, chimichurry, tapenade, peanut paste,etc…and lay accommodating fare to roll. Careful to ensure dry rud, marinade, spread and “ stuffing “ are related unless you are more than aquainted with fusion cooking. We put together this recipe as a NYE treat! Wow! amazing flavors, aroma and texture! It was fireworks ! 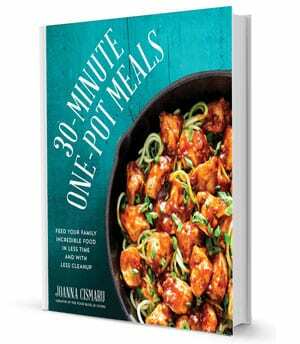 everyone loved it and it will be a “go-to” recipe in 2018! I’m a bit confused which way to roll it from the pictures. 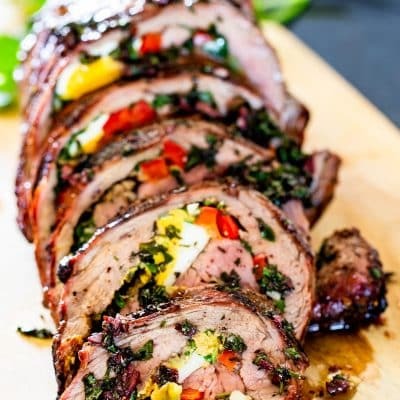 I’m thinking of using thin roulade beef instead and making individual pieces. Flank steak is always tough. This is just one big piece, which you have to butterfly so that it’s a thinner piece then just roll it jellyroll style. Oh my this was delicious. Can’t wait to make it again. I want to try asparagus with it next time. Btw Mia is adorable..
I’m thinking about making this for Easter- something a little different. Can I make it ahead of time and just grill it before it’s ready to be served? Yes that should be fine, just refrigerate it until ready to grill. Is this a though piece of meat can I bake it and for how long. The recipe shows to grill then bake but yes you could bake it as well. The grilling is what gives it the true Argentinian texture and flavour. Oven temperature and times vary, so depending on your oven, you could bake it but would give it a different texture and flavour. Just wanted to let you know that Matambre literally means “hunger killer”, and this is served as a very thin sliced, cold appetizer with bread and chimichurri on the side, much like sandwich meat. My mom also boiled hers, and it was all we could do to not eat it until the next day! Hi! I made this for my family tonight. The flavors were amazing! This recipe was fun to make. I drizzled a small amount of good quality balsamic vinegar over the top. The only complaint from my family was I didn’t make enough for seconds. I have been collecting recipes for each of my 2 adult children. If I make something they love then it gets printed and added to their recipe book. They have all their favorites in one place and personalized for them. This is going in both of their books. This dish would be excellent for a nice dinner party. That’s such a great idea Juli. I’m so glad you guys enjoyed this recipe! Your version looks insane! I haven’t had a heavenly slice of matambre in years, and craving it like crazy right now! My mom used to make it every single Sunday night just because it was my absolute favorite meal on earth. So, between the asados for lunch and matambres for dinner, I’ll never forget the Sundays of my childhood. Now that I’m living alone, have very little time to cook, and got used to more american-style foods, never attempted to make it myself. I’ll probably screw it anyway unless my mom is there with me to help me, because the thing is that she never cooked it in a grill, neither in the oven. She’d put the roll in a big stock pot filled with water to the top, let it boil, add some sea salt and let the water evaporate, about an hour, maybe a little more. So when the juices of the meat that were contained on the water started to reduce, it would form some sort of a sauce, that was the thing that would give to the matambre a gorgeous golden brown tone, plus it would be covered in that yummy, sticky, savory sauce that would make it feel like it was a resemblance to what food probably tastes in heaven. Does it sound like too much? LOL. My mom was a genius. Thank you for bringing me so many memories! Now I’ll have to make the attempt and try it, with my mom at the phone, of course. Did I forget to mention that I’m from Buenos Aires, living in New York right now? Well, that. Hi! I’m a college student living in the dorms, and don’t have access to a grill. What changes would I need to make to properly cook this in the oven? Do I have to worry about it drying out or cooking improperly? My roommate and I were in the mood to cook something really nice next week but neither of us are terribly experienced. If you’re not going to use the grill I would first sear it in a pan on all sides, so it gets a nice color then I’d roast the matambre in the oven for about 45 min to an hour at 375 F degrees. This looks fantastic and I really want to try it. Do you think I could omit the egg and still get the gist of the thing? Obviously it won’t be exactly the same, but my fiance hates eggs so I kind of have to. Oh yeah absolutely, you can add other veggies if you want, olives, mushrooms, whatever you prefer. I would definitely go with 3 or 4 flank steaks. Oh Jo this looks wonderful!!! I love how gorgeous the eggs look in there…and that tip on how to butterfly is so gold! You make it look super easy! I find the word butterfly is typically very scary but you made it look easy as can be. And Mia… just the sweetest doggie ever 🙂 Have a great weekend! Could I possibly just put this in the oven to cook? Yeah, this looks pretty darned amazing and delicious all rolled up into pure awesomeness. Great job on the recipe. Looking forward to trying something like this soon.